1. Fill a large mixing bowl with water. Squeeze the juice of 1 lemon into the water. 3. Thinly slice 3 cloves of garlic and set them aside. flakes, lemon peel, and 4 sprigs of thyme. pieces. Add the artichoke to the skillet and adjust the heat to medium. begin to turn tender (after approximately 10 minutes, taste a piece to see how tender it is). approximately 2 minutes, until the wine has reduced by half. 8. Remove the skillet from the heat, and discard the lemon peel and thyme sprigs. 9. Set a fine mesh strainer over a mixing bowl. Pour the contents of the skillet into the strainer. remaining liquid from the mixing bowl to a large pot. clean them with cold water to remove any dirt. Slice the leeks into thin half-moons. until they begin to soften. the pot and bring the water to a boil. Adjust the heat so that the water is gently simmering. resemble stew). If too much liquid evaporates during the cooking process, add more water. 16. Rub 1 clove of garlic against a fine micro plane and add the micro planed garlic to the skillet. pepper. Taste the beans. Continue to adjust the seasoning until the beans taste delicious. 18. Add the cooked artichokes, along with the sorrel and the lemon juice. 19. Stir regularly over low heat until the sorrel just begins to wilt, approximately 2 minutes. 20. 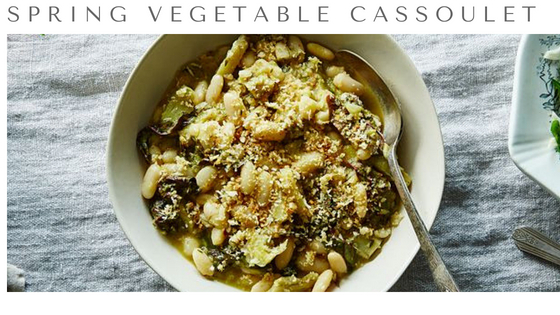 Serve the cassoulet garnished with a sprinkle of garlic breadcrumbs and enjoy.